It's been a quiet Sunday. I did some coughing and wheezing in the middle of the night so I had to stay home this morning. I slept in until 10:00, then I got the laptop and all of us piled up in the bed except Maggie, who was asleep in her new favorite spot on the headrest of your recliner. It's been hot and humid today so I decided to let mowing wait. Storms came through this afternoon, and next week is supposed to be in the seventies and drier. And as usual this time of the summer, it isn't the grass that needs mowing. It the tall seed heads on the weeds. They can wait a day or two. The highlight of the day was talking to Donna. We met on the first day of eighth grade, and I wonder what we would have thought if anybody had told us that we'd still be talking on the phone forty-six years later. There are very few people who have known me so long and so well. And she still admits it in public, bless her! I think we first connected over sports - very few eighth-grade girls are serious about their sports. Donna and I hope to make trouble together next year when I get some vacation days. I want to go to Kentucky and see her and Becky and Alan, and Donna and I are talking about touring Waverly Sanitorium. There's talk about developing it, and I want to see it before they remuddle it. I love old hospitals just as they are, thank you. I don't care a pin about the stories about it being haunted. I just love, love, love old hospitals! And I just realized that I'm looking forward to things again. The depression and anxiety are gone, and it feels amazing to feel like myself again. During that month of severe depression I lost thirty pounds. Yes, thirty pounds in one month. When I get sad I eat comfort food, but with severe depression I don't eat. The weight loss has slowed down, of course, but I'm still losing. My skinny jeans are loose on me! I have a stack of clothes that I need to take up. It's a lovely problem to have. You might do me a favor - ask Mama if she could drop by and help me take up those clothes. It's so much easier when you have somebody else to pin things on you. She and I always enjoyed sewing together. She preferred the machine part and I preferred the hand sewing, so we made a good team. I can't imagine not being able to make and alter your own clothes. I'm so thankful I had an old-fashioned upbringing. So give her my love and thanks. 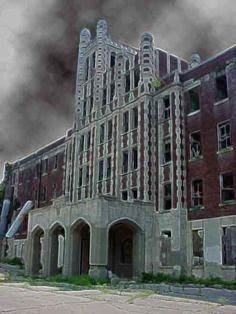 And come with Donna and me when we tour Waverly Sanitorium. I know you - you'll love it!